When a Pulitzer Prize winning fact-checking site announced its “Lie of the Year” for 2011, it set off a partisan firestorm in the blogosphere triggered by liberal critics of that choice. According to PolitiFact.com, a non-partisan watchdog organization owned by the Tampa Bay Times, the assertion by many Democrats that “Republicans voted to end Medicare” earned the dubious honor as Lie of the Year. Democrats had claimed the plan that passed the GOP-controlled House would have ended the popular health program for seniors. PolitiFact determined that while the Republican plan would alter Medicare, it would not “end” or “kill” the popular program. Some liberals, notably New York Times columnist Paul Krugman, disagreed, asserting that the GOP plan for private vouchers changed Medicare so much that it would, in fact, end the program. For the week of December 19-23, the debate over the Lie of the Year was the No. 3 subject on blogs, according to the New Media Index from the Pew Research Center’s Project for Excellence in Journalism. Left-wing bloggers overwhelmingly supported Krugman’s criticism, arguing that the GOP did try to end Medicare, even if they kept a program around with the same name. Others agreed that PolitiFact was guilty of buying into a false equivalency between lies told by Democrats and those told by Republicans, and that the site’s motives were less about facts and more about appearing non-partisan. Conversely, conservatives applauded the award and chastised Democrats for using scare tactics aimed at seniors. While many conservatives acknowledged they do not generally trust PolitiFact-which has previously come under attack from the right-they were glad a prominent organization called out Democrats for using a falsehood. Most conservative bloggers agreed with their liberal foes on the political motivation behind PolitiFact’s ruling, but supported this specific decision anyway. “While I share Mark Hemingway’s concerns about the rise of fact-checking operations, he also points out that it is harder to get one of these operations to point out a misleading claim from the Democrats, so that fact that the Medicare claim topped the list gives this assessment an added level of credibility,” decided Tevi Troy at National Review Online. The controversy led some to question whether the idea of a non-partisan and objective fact-checking operation was even viable in the current political climate. “I wrote about the core problem facing the new breed of political fact-checkers: The political right is more factually wrong, meaning that taking a strictly ‘bipartisan’ approach will inevitably leave the fact-checkers themselves guilty of phony ‘balance,'” asserted Chris Mooney at DeSmogBlog. On YouTube, the reaction of North Koreans to the passing of the Supreme Leader of North Korea, Kim Jong Il, drew the most interest-in part because the videos contained scenes that surprised many viewers. Two of the top five most viewed news videos on the site last week, including the No. 1 clip, consisted of North Koreans openly weeping and mourning over the death of their leader for the past 17 years. To many observers, the shots of civilians crying over the death of a dictator who oppressed the North Korean people were shocking and unbelievable. The vast majority of those who left comments about the video refused to believe the emotions were genuine. Other than the debate over PolitiFact, technology was the major focus in the blogosphere last week. The No. 1 subject was the same as two weeks ago: positive reviews of the brand new tablet computer called Asus Transformer Prime. Last week, all the links were to an Ubergizmo article which said the device “is easily the best Android tablet and is possibly the best tablet, period,” and included many pictures of the computer and a video of someone taking the product out of its packaging. A post on the official Google Blog about future improvements to Google+ was the No. 2 subject. Among the promised additions will be the ability for users to control the volume for different individuals they are having streaming conversations with, and more useful and attractive notifications. The fourth-largest subject was a post on the New York Times technology blog about Apple and Google beginning development of “wearable computers.” These new products would make traveling with smartphones easier by attaching them to one’s clothes or body, such as being wrapped around a person’s wrist. 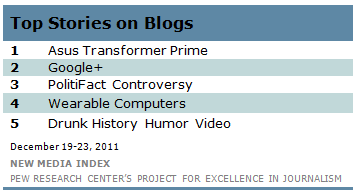 The fifth most linked-to page was a humorous video on the comedy site, Funny or Die. The clip, part of a series called “Drunk History,” features an intoxicated man reciting a well-known Christmas poem while famous actors act out his strange utterances. On Twitter, there was a heavy emphasis on pop culture news, especially the famous musicians who are often a staple of the top Twitter topics. The most linked-to subject was the trailer for the upcoming film The Hobbit, to be released in 2012 based on the J. R. R. Tolkien book of the same name. Siwon Choi, a popular South Korean singer and actor, was the second biggest subject as several of his tweets and pictures were frequently re-tweeted. Among them were a photograph of a sun setting over a city street with the message, “Time will heal all” and a picture of three people looking very excited while anticipating the arrival of Santa Claus. For the second time in three weeks, the British-Irish boy band One Direction was a popular subject. 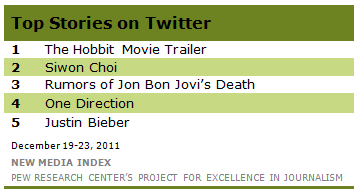 Last week, a video diary where the group answered questions from fans was the fourth-most tweeted page. And a video of Justin Bieber singing his version of the Christmas song Mistletoe was the fifth Twitter story last week.